Your company uses Outreach to create email templates and track emails. So why should you use the sharing feature within KnowledgeTree? It's the same thing, right? No. It isn't. Using Outreach in conjunction with KnowledgeTree can garner even more tracking analytics for not only sales, but for marketing so that they can better assist sales with the right content! Here are a few simple steps to gain value from both Outreach and KnowledgeTree when sending content specific emails to prospects. 1. 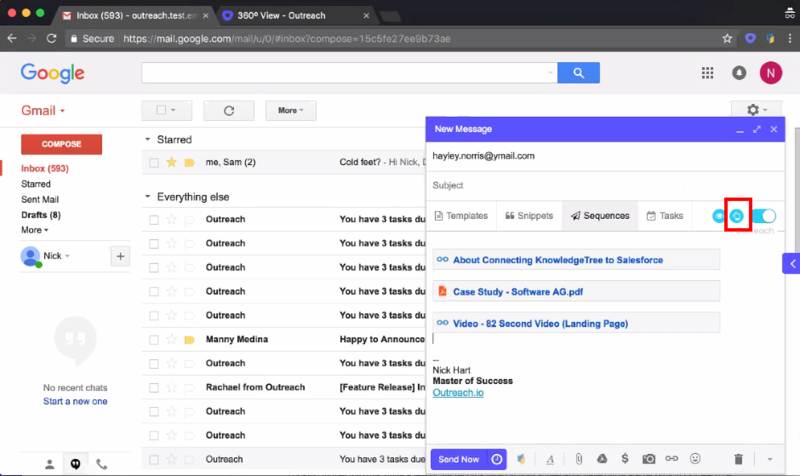 While using an Outreach template, discover and attach the desired content from our KnowledgeTree for Gmail or KnowledgeTree for Outlook extension. Just click the KnowledgeTree icon! 2. You can also Discover the desired content in KnowledgeTree for SFDC and click the share icon. Paste the share link into an email or an email template from Outreach. Now you'll get notification notification from KnowledgeTree when the content is viewed and downloaded!